Comment: M51, the 'Whirlpool Galaxy' in Canes Venatici is famous for its beautiful spiral structure, first noted by Lord Rosse in 1845. It was discovered by Messier in October 1773 and catalogued by him in January 1774. Its companion galaxy, NGC 5195, was discovered in 1781 by Messier's colleague, P. Mechain. The M51 system is a spectacular example of interacting galaxies - in this case NGC 5195 is being "ripped apart" by the huge gravitational disturbance of M51, while M51 has in turn undergone huge structural alteration from the gravitational effects of NGC 5195. 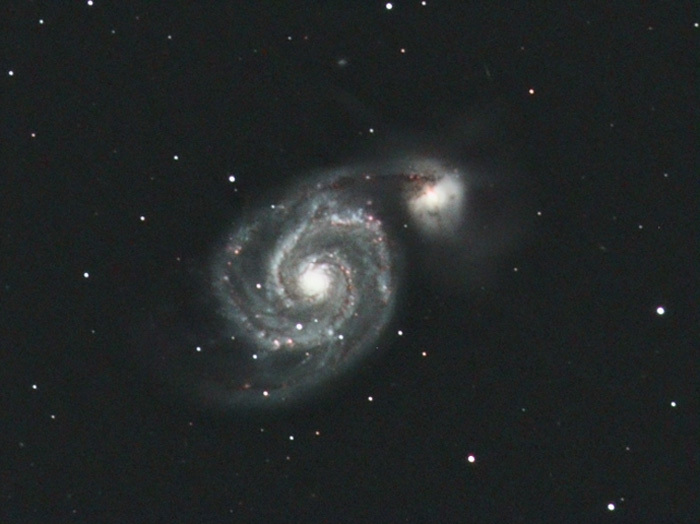 The distance of M51 is estimated to be about 37 million light years. The image below shows just the 'L' component of my LRGB image, annotated to show other galaxies.